Sorry about that. I try not to let my personal drama enter these missives but sometimes circumstances overwhelm me. Why must we give up at least one free kick every match at a kickoff? I mean, really! Gifting free possession to international sides by screwing up an unpressured kick is not a winning strategy. If Agatha Christie had a love child with Sir Arthur Conan Doyle this mysterious child could not have posed a more Gordian problem and it may require as dramatic a solution as Alexander’s. That being said, any Olympic dream really should be accomplished via a reference to Greek legends – it brings a nice symmetry to the dramatic arc of international sport. Once that is accomplished the smaller problem of introducing Perry Baker to the sideline should be relatively easy. That way the esteemed Mr Baker could recognize his proximity to the sideline before he is literally stepping over it, necessitating a pirouette and a desperate and dangerous lob pass back inside to his support. Speed kills, yes, but so do unforced turnovers. The USA Sevens has enjoyed yet another record year for attendance, as 75,761 fans took in the tournament at Sam Boyd Stadium over the course of three days. That sets the attendance record for a rugby event in the United States, beating 68,608 from the 2014 USA Sevens. Friday saw 15,294 fans come through the turnstiles, Saturday 34,593 and Sunday 25,874. The event has broken its own attendance record each year since moving to Las Vegas in 2010. One of the great benefits of being a member of the flock is the opportunity to go on exchange. Not only are the exchanges paid for by the society, while on tour you will find it exceedingly difficult to buy a pint as your hosts will insist on paying. 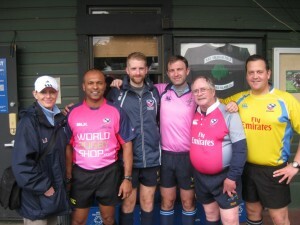 The chance to referee rugby in other parts of the country and the world is always an experience to cherish. That being said, the best way to get to the top of the exchange list is to host incoming referees. The executive committee notes well who volunteers to open up their homes to our travelling brethren and sisteren. We are currently looking for eager volunteers to host incoming Virginia referee Patrick Benner, who will be here on March 28 and will partake in the tournament at Napa. This, of course, includes billet and ferrying him around as per custom (as well as not allowing him to pay for a drink). Many of you have been at the receiving end of the Virginia hospitality, so you know how important their refs are to us. Beyond the customary fellowship and good will these exchanges provide, our exchanges enable us to provide growth and official recognition for our own referees. If interested contact Bjorn Stumer at bstumer@att.net. Sir Knowitall, we here are in Pelicanland are all aware of and in awe of your staggering mental gifts and would be honored if you would consent to share some pearls of wisdom with us. Keeping up with you is always a challenge and if there is anything you can say about rugby referees it is that we enjoy being mentally challenged. Presenters have 30 – 40 minutes with time for questions. If interested, please email Vicki Hudson at coachvickih@gmail.com. With the USA 7s firmly in our rear view mirror the business of league rugby resumes and we have a full schedule on tap for this week. Please go to assignr.com to confirm your availability and matches, or if you haven’t received an assignr.com account, contact Pete Smith at me@petesweb.com to let him know you are available. To get an assignr account please contact our Scott Wood at rscottwood@gmail.com. He will get you all the information you need to sign up and announce your availability. A beautiful Monterey winter day, only marred by the traffic for the golf tournament. The field is in great condition and well marked. Sierra looked rag tag while CSUMB warmed up, appearances can be deceiving. Sierra have a number of players that have come through the Sacramento HS league while CSUMB had many of their more experienced players out for a variety of reasons. Sierra were direct, instinctive and powerful, while many of the CSUMB players were still thinking through each action. Game time will bring experience and understanding, but it is a hard learning curve. Sierra scored five tries with two conversions in the first half and four tries with one conversion in the second half. CSUMB scored a try in each half with one converted. It was a beautiful day in the Central Valley with clear skies, but it was obvious it was going to be hot. Yeah, the forecasters were calling for high 70’s to mid 80’s, dependent on to whom you listen. Both teams were actively warming up prior to me getting to the pitch. That is always a good sign in my opinion. The first half showed each team’s defense was up to the challenge even when the occasional break was made. It wasn’t until the 24th minute for the first score be posted with an unconverted try by SF State. Three minutes later, Fresno State responded with a converted try and ended the half with an unconverted try at then end of the half. Halftime score: FSU 12 – SFSU 5. The second half started off strong for SF State with two unconverted tries in the 4th and 7th minutes. Both teams settled down and the defensive struggle ensued again. Fresno State was able to get a penalty in the 52nd minute. SF State continued to push, but Fresno State scored another unconverted try in the 61st minute. The game continued to still be hotly contested right up until the final whistle. Overall, it was a fun game to referee with good sportsmanship shown by both teams. And did I mention that it was hot out today? Pacific has developed a very good game plan and the players appear to have bought into it. Solano has some good-to-great athletes but face typical issues found in relatively new teams. UOP scored six tries in the first half and another three in the second before Solano found the goal line. Three more tries later and we closed the books on a fast-paced, not always one-sided, match. Both teams came ready to play and looked quite good to start. UNR had some disciplined defense to start, Sac State kept the ball in possession well. The first score came when UNR had the ball and a Sac State player picked the pass and ran about 80m for the try. A second pick off came a few minutes after that. UNR consolidated and made their offense more conservative and pushed in a forward try just a bit later. The first half ended after both teams scored again, and UNR made a penalty kick for points, so was up 22-19. In the second half, players got more aggressive but also less supportive. Several penalties were caused by players running alone and trying to hold onto the ball with no support. Sac State got 2 early tries in the second half with speedy wingers. UNR came back with a couple of tries of their own, but didn’t convert, which cost them the game. Final score was 36-32. Sac State opened the match strong, running back the kickoff down to the Santa Cruz 5 meter line. Santa Cruz held off the attack then proceeded to rack up 4 tries in the first half. Sac State incurred a number of early penalties related to entering tackles from the side. There was an obvious gap in their understanding of the gate. It took a quick chat with the coach during the match, then a few minutes of instruction at half time to square that away. Sac State rallied in the second half, drawing to within a try before Santa Cruz got reorganized and pulled ahead. Awesome display of tackling & rucking by Sonoma State. I don’t think they missed a tackle. Their #8 & outside center had some great runs, but it was a team effort. Humboldt State came back from being down 43-0 at half to score 2 tries to Sonoma State’s 3 in the 2nd half. Good crowd support on a very warm V Day. The score at the half was 54-5 to for Saint Mary’s. The second half saw a complete team change, and referee, as the Saint Mary’s 2nd side needed to have a run; San Jose Seahawks were scheduled to play the B’s but we’re not available. What a field at St Mary’s, in the stadium! The scoreboard keeps track of tries and conversions. The field is luscious! The day was about 75 degrees warm, to boot, so it was a glorious day on Saturday at St Mary’s. Except for one thing. I was supposed to ref St. Marys B side against the Seahawks 1st Side, but San Jose called the St Mary’s coach shortly before before game time and said they were not coming. Tim O’Brien, St Mary’s coach, decided to play his B side in the second half of the first side game, to get everyone a run, at least. The first side game was about 40-7, so Tim thought it would be ok.
Paul Bretz was the first side ref. Tim talked me into reffing the second half and Paul graciously allowed me to take his second half. So the game was fun. The students played well. They were gentlemen, coached well! Watching Paul Bretz was a highlight for me. Dealing with great coaches, the best ref in Nor Cal and in such a nice facility, it was kind of a dream rugby day for me. One scrumhalf and a starting prop were products of my and my son’s high school program and therefore, were friends of mine. Good to see them playing well at a pretty high level. ??s??uo? ? ?,us?? ?? pu? p???u? ?op ?? ?d p????o? ?uo ?ll????ds? pu? ???? ?uo ‘ll??? ?O ¡? ?nO ?0?/6 ? ?? s?? u? ?d s?? p??? ?s ??? ?ld ??? pu? p?????? ??u?lnq?? ??? ?p???o?uo? ???? p? ?ool ??? s?? pu? ?sol? s?? ?? ‘u? ?s ??? ??no??? dod ?,up?p ?uoq ??? ?l??? ‘pu? s??? ?ld zn?? ? ?u?S ?? ??? ?o ?uo o? ???? ?l?? ??o? ?q ?sn? ??? ?q ??? ? ?s?u s?? ????? ?s?? ?p ?? o? 9-?? s?? ? ?o?s ??? ?????l?? ?? ?l???u?? u? ‘?u?l???? o? pu? ???? ?l???? ??? o? ????o? o? ??u???nl?? ? ???? ?o?s o? u?? ?q ?u?uo???puo? ?? ?ood ,s?nlS ??? pu? ???? ????ou? puno? s?? ?p ?? ‘?l?? ?s??? ??? o?u? s??nu?? ??u??? puno?? ?? ? ?-9 dn ???? (zn?? ? ?u?S ??) s?nlS ??? ‘u? s??nu?? ?? ?noq? ?? ?p?????? ?lu??? ?l???? ???? pu? ??? ?p pu? s?n? ???? p???? ?s s???? ? ?oq ?ss??? uo p?? ?ld u??? s??? ??ssn? ?? o? ?q?n? ?? ?l ??o? s?oo? ?uo un? o? ??ns??ld ? s?? s?? ?p ?? ?? ‘??? ?d ss??? ??? ???u?o??l?? u???? ?oN u? ? ?p s,???u?? ?uuns ????ou? Overmatched team for UCSC but they played hard to the end on a very warm day. No discipline problems. A fine looking group of officials from PRP week 2 at SFGG. This entry was posted in News on February 17, 2015 by James Hinkin.